We Have Your Induction Cooktop FAQ with quick links! What’s the difference between an induction cooktop and an electric or gas cooktop? Is an induction cooktop hard to use? 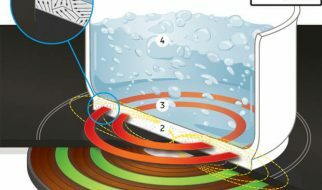 Is an induction cooktop expensive in terms of electricity draw? Does an induction cooktop produce any health hazards? Can an induction cooktop’s magnetic field interfere with other electronic devices? Do I have to use any special cookware with my induction cooktop? Are there special techniques or a learning curve associated with using an induction cooktop? Is the cooktop surface glass? How easy is it to scratch or crack? Does an induction cooktop require any form of ventilation hood? Is an induction cooktop noisy? Electric cooktops feature a heating element where current is passed directly through it or gas where a direct flame is applied to the pan or pot in question. In both cases, roughly half or more of the heat never actually makes it to the food you’re cooking. The former, while fairly uniform, doesn’t allow for much precision in terms of heat intensity or cooking precision. The latter allows this heat intensity and precision, but can be more expensive, comparatively, than electric. In addition, both can tend to heat up a room with that lost heat from cooking. On the other hand, an induction cooktop does not create heat on its own. It operates based on the principle of electromagnetic induction. Electricity is passed through the copper coil installed inside the cooktop creating a magnetic field which then interacts with the ferromagnetic (cast iron or steel) cookware causing the pot or pan itself to heat uniformly. This gives you the energy savings, or better, of an electric cooktop married with the heating intensity and cooking precision of flame. Best of both worlds, except for the delicious char you can get with flame. While the settings and temperature ranges will vary between devices, they’re pretty straight forward and easy to use. From pre-set temperature settings to the ability to adjust by 10 degree increments, along with timers, etc. As a note about temperature ranges from cooktop to cooktop, you can find some that will start as low as 50 degrees all the way up to 600 degrees. In general, most have a range between 100-460 degrees. The short answer is, no. You might think because of the temperature range some of these units are capable of, that it would be more expensive to use. In fact, the opposite is true. Because of how quickly and uniformly they produce heat and because that heat is created in the cooking material itself, you save cooking time and use less electricity than when using an electric cooktop. Aside from a hot pan, no, with one possible caveat. That caveat is that because an induction cooktop produces a magnetic field, it might have some effect with some form of cardiac device. While there is some research in place that tends to show this not to be an issue, it would be best to consult with a certified medical professional. Highly unlikely, unless you place some form of electronics right next to the unit. The electromagnetic field that an induction cooktop creates has a very short range which is absorbed by the cookware itself. In addition, this field is only created when the unit detects a sizable appropriate surface. This is why you can put your hand on the unit, while wearing a ring or rings, and nothing happens. There simply isn’t enough ferrous metal detected for the unit to kick on. Yes. Induction cooktops only work with ferrous metals such as cast iron, enamelware (cast iron coated in porcelain or ceramic) or stainless steel cookware. If in doubt as to whether a piece of cookware will work with your induction cooktop hold a magnet to it, the kind that stick to your refrigerator will do fine. If it sticks, you’re good to go, if it slides right off, pass it by. There are no special techniques that you need to learn, aside from adjusting the settings on the unit, but there is a learning curve. Because of how efficient the unit is with rapid and precise heating, with the ability to set temperatures close to, or over, 500 degrees quite easily, you’ll need to do some practice runs. If you jump right into it, you may end up with a burnt meal. Try boiling various levels of water in different sized cookware, at different settings. This will give you a feel for how fast and efficient the unit is. From there, move to cooking items that aren’t too expensive, like eggs, to see what settings you need. Once you have this baseline, maybe 30 minutes or so of time invested, you can experiment from there. You’ll be cooking amazing meals in no time! The cooktop surface is actually “ceramic glass” which deals incredibly well with large and rapid fluctuations in temperature and is quite tough. Though I wouldn’t recommend dropping heavy cookware onto the surface. It is possible to scratch the surface of the cooktop, but not very likely, unless you slide something abrasive across the cooktop. No, as you’re not cooking with gas and almost all of the heat goes into the cookware. The only case when this might be a consideration is if you overcook your food, burning it, causing smoke to rise from your food/cookware. Induction cooktops make little to no noise, aside from a possible “click” when turning on or off. The majority, if any noise caused from using an induction cooktop would come from the cookware and utensils themselves, along with the sound of your food cooking. 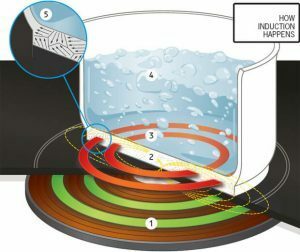 I hope you found this Induction Cooktop FAQ helpful! If you have questions that aren’t answered here, please let me know and I’ll get it added.